Alastair Greene’s musical journey has been anything but traditional. His combination of blues, Southern rock, and jam band sensibilities have been thrilling audiences for nearly two decades. With recent appearances at the Chicago Blues Festival and the Big Blues Bender in Las Vegas, as well as guest appearances with such luminaries as Eric Burdon, Walter Trout, Coco Montoya, Savoy Brown, John Nemeth, and Debbie Davies, it’s crystal clear: His star is on the rise. The culmination of his musical experiences, influences, and passion is manifested as his new record, "Dream Train." The album was produced and mixed by David Z, whose production credits include Buddy Guy, Gov’t Mule, Kenny Wayne Shepherd and Jonny Lang. "Dream Train" features 13 new songs, 12 of which are Greene originals. The sole cover is a previously unreleased song written by none other than Billy Gibbons of ZZ Top called "Nome Zayne," which was recorded with Billy’s blessing. 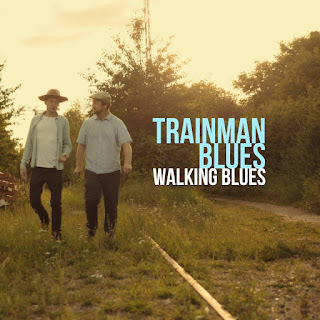 The songs on "Dream Train" range from the hard driving blues rock of the title track, to the sensitive Curtis Mayfield tinged instrumental Iowa. 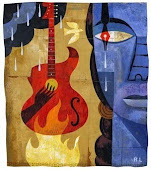 "Big Bad Wolf" finds the band in familiar boogie blues rock territory while "Daredevil" takes listeners on more traditional blues shuffle ride. "Dream Train" also features an impressive array of special guests including: Walter Trout, Debbie Davies, Mike Zito, Mike Finnigan, and Dennis Gruenling. 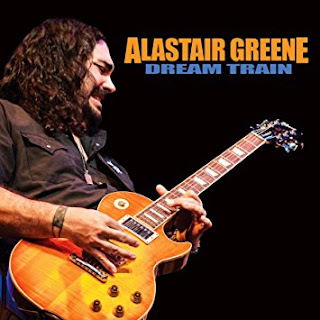 Alastair is supported on "Dream Train" by his touring band consisting of Jim Rankin on bass, and Austin Beede on drums. Marty's review: right from the first notes you know this album is going to grab you by the throat and not let go. Alastair's licks are first class, and the driving rhythm behind him gives a punch that will more than knock you out. From the blues-rock of the title track to the boogie of "Big Bad Wolf" and "Noma Zayne", the smooth blues instrumental "Iowa" and the one acoustic number "Song for Rufus", the 13 tracks on this release will please fans of the likes of ZZ Top, George Thorogood, Rory Gallagher and Robin Trower. 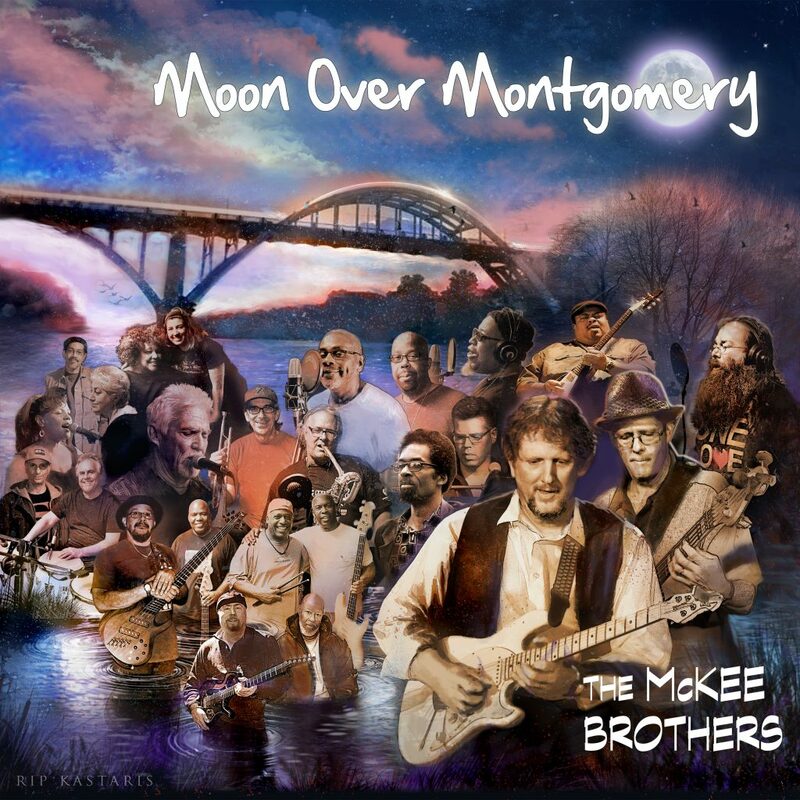 “Moon Over Montgomery,” the second release by The McKee Brothers, once again features inspired performances by a talented roster of players from Los Angeles and Michigan, including soulful vocalists Bob Schultz (original keyboardist with Bob Seger), Jeff Robinson, Reggie Gonzales, Maxayn Lewis, Laith Al-Saadi (vocal and guitar – 2016 finalist on “The Voice”), Larry McCray (vocal and guitar), guitarist Ari Teitel, keyboardists Bobby West and Jim Alfredson (formerly with Janiva Magness and in Organissimo), horn players Lee Thornburg (formerly of Tower of Power, now touring with Joe Bonamassa) and Doug Webb (Posi-Tone Records recording artist), bassists Bobby Watson (Rufus), Al Threats, and J.V. Collier (Bruce Hornsby) - as well as the brothers themselves: Denis McKee on guitar, keyboards, bass, and vocals, and Ralph McKee on bass, lap steel guitar, and vocals. The music is high-energy and soulful, in several styles, from gospel (the inspirational title track paying tribute to the 1965 civil rights march), gritty funk ("Go 2 Work!," "Bayou Man," "I Feel Like Dynamite," "Blues of the Month Club"), soul ("Where You Gettin’ It?," "Runaway Love," and the Latin-flavored "Late at Night"), jazz-blues ("Kicks"), to the funky country of "Confidential" and the rock of "Remember When." Check out Laith Al-Saadi’s vocal and Larry McCray’s guitar on "Worried About Tomorrow," the incendiary blues vocal by Jeff Robinson on "You Know How I Lie," with smokin’ guitar by Al-Saadi, the rhythm section’s irresistible New Orleans grooves on "Flat, Black, & Circular" and "Pigfeet," the great Lee Thornburg horn arrangement on the gospel ballad "Celebrate Me Home," and some impressive guitar work throughout by Denis McKee. 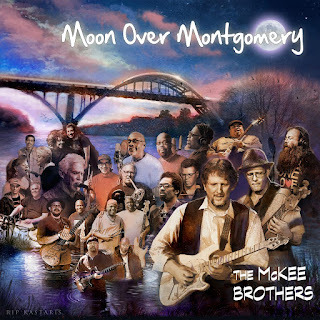 Marty's review: with a cast of thousands (well, a couple of dozen) and a generous 16 tracks, this 2nd release from the McKee Brothers has the works. From brassy soul-blues to roots based licks and gospel ballads, this well produced album has enough fuel and ammunition to get you to the moon and back. All you would except from a class act and more. If there is a blues equivalent to the wall of sound, then this might be it. Trainman Blues is a 4 piece modern blues/roots band, soaking the rawness and simplicity of 50's style blues with modern production techniques. With three singles released and a debut album set for release in February/March, this band is picking up steam. Based in Copenhagen, Denmark, the band is comprised of Irish singer/guitarist Richard Farrell ( https://www.richardfarrellandt helasttribe.com/), Ronni Boysen on guitar (Kokomo king and Mud Morgenfield), Laust Nielsen (Blues Producer and Mojo's in-house Bass player) and drummer Thomas Crawfurd ( Fried Okra Band). Richard is an Irish man who has found his spiritual home in blues music, he breathes, sleeps and sings the blues, it is second nature to him. From the chugging sounds of the train to the warbling voices of the gospel singers, Richard and his band encompass a wide sound. He sings with guts and all heart, playing a a hollow body guitar in a finger style manner. On the bass guitar is Laust Nielsen, planting delicate and warm bass lines with ease and precision. Laust has been sculpting and producing the songs with Richard for the upcoming album. The up coming album and new single display a new take on blues production, combining a taste of the old and new, with a laid back and downplayed feel, the songs wash over the listener with soothing charm and intriguing ambience. 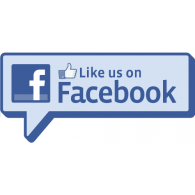 Featured on the upcoming album and also playing in a live setting are blues aficionados Ronni Boysen on guitar and Thomas Crawfurd on drums. Ronni commands and weaves powerful riffs and solos on the guitar, playing with the likes of Mud Morgenfield ( Muddy Water’s son) and Kokomo Kings, his tastefulness and vigour for blues reaches beyond the shores of Denmark. Thomas is a melodic and thoughtful drummer, who has finely tuned ear for creating beautifully layered, simple textures. Thomas plays also with Fried Okra band. American blues-rock guitarist, singer and songwriter Joel DaSilva new album "Everywhere From Here"
Joel DaSilva is an American blues-rock guitarist, singer and songwriter hailing from Chicago, Illinois, and currently based in Fort Lauderdale,Florida. 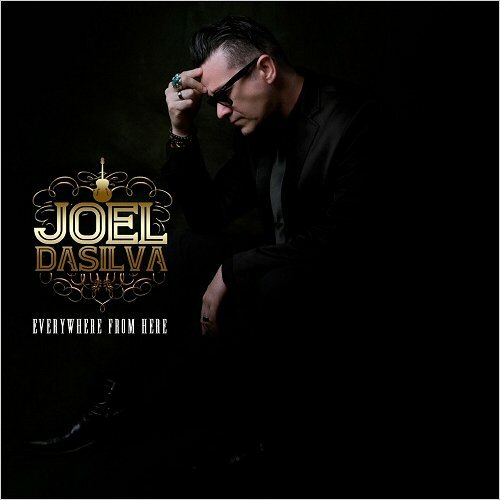 He has recently released his brand new album, "Everywhere From Here". The album was produced by Grammy winner Eddie Perez at TruNoyz Studios in Fort Lauderdale. Joel, who has been performing as a lead guitarist and vocalist since the age of 18, was the front man for the renowned South Florida blues band The Hep Cat Boo Daddies for 13 years before breaking out on his own as a solo artist. Besides acting in several independent films, Joel's resume includes performances with dozens of blues, rock, and roots notables, including B.B. King, Ray Charles, Leon Russell, Johnny Winter, and The Fabulous Thunderbirds, among others. Delving back deeply into his Chicago Blues and Americana roots, DaSilva has emerged with some truly visceral new material, the culmination of months of soul searching, hard living and late night driving. The first single from the album is titled "Shake," and is a simmering, swampy slow-burner of a song that builds to a fiery guitar solo and really shows off Joel's power and passion. Solo Elektro is award-winning guitarist Gwyn Ashton’s new one-man lo-fi garage stoner distorto blues-rock album. Full of chord-crunching fuzz guitar, dirty octave dividers and slamming kick drum, it’s a 100% explosive live-in-the-studio recording, sounding retro, with a modern evolution, as heard on the riff-pumped 'She Won't Tell Me'. If you like Sgt Pepper, Jack White and The Black Keys, you'll LOVE Solo Elektro! The album is heavily inspired and a homage to mid 60's Beatles albums. 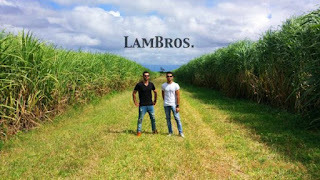 Aussie blues brothers "LamBros." release fiery new single "Do Something"
Up and coming Australian brotherly duo, LamBros., have just released their newest single, "Do Something". They've been playing around the country for the last few years at festivals including the Byron Bay Bluesfest. The song is about the way of tackling the inner demons we face when deciding what to do with our lives. It seems like people are constantly making decisions between doing what they love, or what society tells them to do, and we think that life's too short to live like that. We want people to live without regrets, and live on their own terms. They wrote and produced the song themselves. 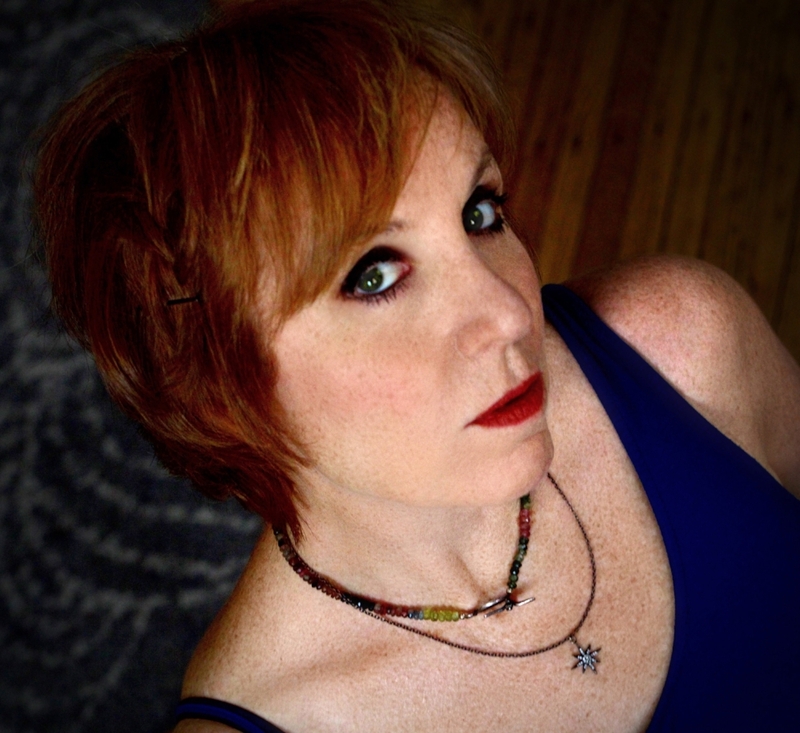 Barnett rose to become one of the top 20 session singer calls, while continuing her search for her own essential expression - the essential songs, the essential timbre, the core family of musicians. “I was also going through the long process of my marriage ending. My partner and I needed to set each other free in order to be ourselves. 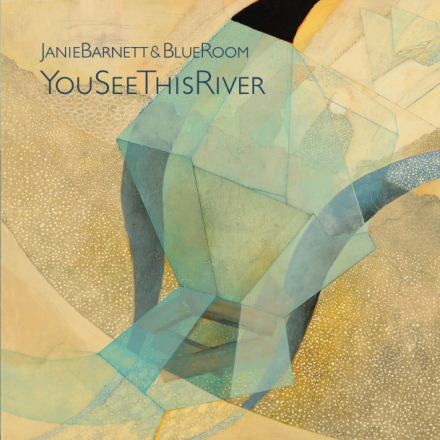 I recognized I had to own that process in the music.” Several collections of music were released through those years, but none Barnett felt had fully captured her authentic voice as a writer or musician.